Get a taste by checking out the Trailer! 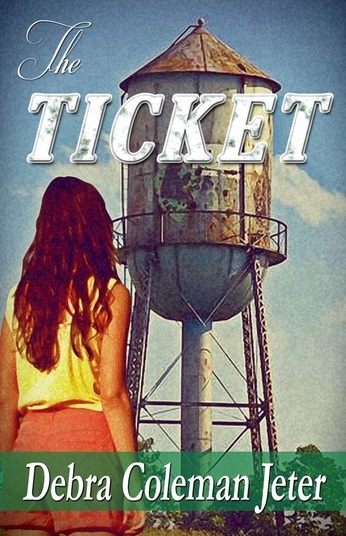 "The Ticket is a story that aches to be read. In Tray Dunaway, Debra Coleman Jeter has created a character who feels as real as you or me, with doubts, joys, problems, and dreams that seem unreachable. Watch as Tray reaches out, latches on, and starts becoming the beautiful woman she will be." "After [reading it], I was buzzing like I'd just viewed an action-adventure movie, and realized that there wasn't all that much physical action in the story. This is excellent story telling. It leaves loose ends that have the reader thinking, not just about the characters or heavy questions generated by what they deal with, but about one's own choices, those already made and those awaiting a decision." "The characters in this book are unique, interesting and possess strong potential to be memorable. A grandmother who longs to fix mistakes from her youth and find independence, a mentally unbalanced mother, and a daughter who lacks the confidence to pursue her dreams . . . quite a mix with amazing dynamics. The story abounds with tensions and conflict." "Thoughtful and introspective, honest and sometimes raw, I found myself pulled in to her life. Worth your time." "Made me look back at my own [life]… relationship of me and my father....and my mother....absolutely loved this story." "The real story is how a girl with self-esteem issues deals with family relationships Most of us can relate to those feelings of being invisible and at the same time -having everyone's critical eyes on you all the time." When her father is given a ticket that wins the state lottery, fourteen-year old Tray thinks her life is about to change; and it does, but not in the way she hopes. It is 1975, an ordinary year for an ordinary Southern family. TRAY DUNAWAY, like thousands of other teenagers around the country, longs to be part of the popular set at school. She’s growing too fast, and her clothes no longer fit properly. The only person who understands is her grandmother, GINNY, but the kids at school make fun of her when she wears Gram’s hand-sewn clothes. She is tired of being too tall, too bony, too uncoordinated. Tray’s mother, EVELYN, lies in bed most days with a headache, and her bipolar tendency toward extreme highs or desperate lows veers more and more often toward depression. Tray’s grandmother Ginny, who lives with the family, still grieves the loss of her husband, Brook. It’s been six years, though, and she knows Brook would want her to get on with her life. She believes it’s time for her to move out, if she could afford to, and find a place of her own, maybe even a new romance. This doesn’t look likely, given the state of the family’s finances. Then something extraordinary happens. A down-and-out friend of the family, PEE WEE JOHNSON, buys an extra lottery ticket. He gives it to Jesse as a thank-you for driving Pee Wee to Hazard, Illinois, where he purchased the tickets. And what do you know? "Wow! … a wonderful book. Debra Jeter's ability to portray the thoughts and feelings … is truly amazing…Maybe this book isn't the kind of page turner a suspense novel is, but this novel is more character driven than plot driven, and it's definitely a page turner … that's the finest tribute this older man can pay." "Complex characters ... Jeter s coming-of-age novel considers the problems that might follow a sudden windfall." "Loved it the first time I read it … loved it the last time I read it! … I grew up in the same era, the 1970s. But this book is for anyone who has grown up socially awkward. Or with big dreams ... bigger than some say you have a right to … This book is also about what can happen when we allow ourselves to just be who we are and to grow graciously in that role." "The story offers up riveting drama. One would be hard-pressed not to root for the likable protagonist and hope that her story eventually ends with a happy ending. There are some authentic life lessons and talking points to be had here. All in all, this is an enjoyable debut by Jeter. " "I LOVED this novel. Jeter has caught beautifully and poignantly the angst of the kind of teenager I was and infused the character's life with powerful plot twists and turns that kept me on the edge of my seat. I literally tried to not sob at places. Did this author know my life? And of course, it's the life of most teenagers, even if they come across as having it all together … I hope Ms. Jeter is writing more books. I can't wait to enjoy them." "What happens toward the end of the book took me by surprise and the ending was a touch of genius … The work of fiction highlights the misbelief that having money is what fixes everything, and readers will come to understand the fact that maybe it highlights more of what is broken in the family unit." "Loved the style of writing, the subtle humor and the life truths that were shared." "It ended quicker than I would have liked simply because I couldn’t put it down … I’m not even sure how to “label” this book genre-wise because it just has the best parts of so many genres." "Jeter does an amazing job of capturing the essence of a young woman growing up in the South with very limited financial resources. Anyone who grew up during that time outside the "popular crowd" will instantly have memories rekindled. A great story and a great debut novel!"